If you need to keep all your data safe and gain peace of mind, knowing faulty hardware and accidents won’t cause your important files and documents to become lost forever, you should definitely try BackupAssist. 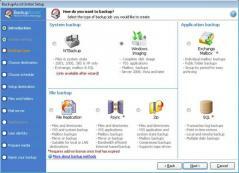 This handy tool can backup, restore and recover files, folders and applications, but also SQL databases and e-mails. It installs quickly and uneventfully, plus no third-party software or adware is included within the setup. The simple UI offers a navigation panel, several buttons and a menu bar. While it’s definitely easy to use, BackupAssist includes comprehensive Help documentation. Users can choose from various types of backups, like data replication, drive imaging, ZIP 64-bit compression, and SQL or e-mail backup. After selecting which type of backup you want to work with, you’ll have to go through an installation wizard, that lets you configure the backup process by setting the source directory, schedule, destination location, name and description. You can monitor the backup process, but also create detailed deports that include number of errors, start and end time, data usage information, label, job name and computer. You can also see event logs in the application’s main window, including the date, event, category and error level. Furthermore, users can create a bootable media, useful when you need to perform system recoveries as it lets you restore all the data from a previously created backup. Recovery of permanently deleted files.